UPDATED: Sun., Dec. 17, 2017, 6:43 p.m. 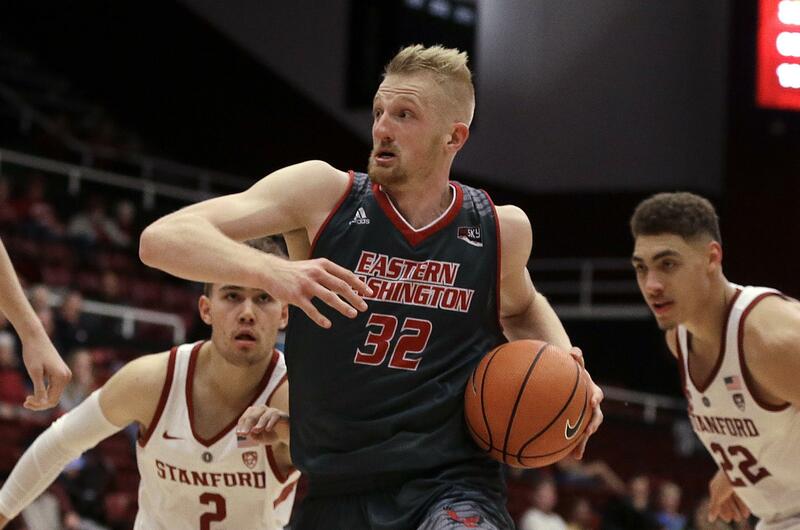 This Eastern Washington basketball team is still searching for an identity. This being Star Wars weekend, let’s just call them the Phantom Menace. That’s because after five weeks on the road, no one really has a clue how good the Eagles can be this year. The mystery only deepened Sunday afternoon at Reese Court, where Eastern rolled to an 86-58 win over Cal State Northridge. Call it bad timing on their first home game since Nov. 10, but the Eagles were competing with the Seahawks while their fans were coping with icy roads. Attendance was given as 1,279, but fewer than 500 people were in the stands to measure the Eagles’ progress during their five-week odyssey. Certainly the Matadors (1-9) were no measuring stick; they came into Sunday’s game as the worst Division I team in the country – 351st according to their RPI rating. Eastern took advantage, seizing a double-digit lead by the middle of the first half and taking a 39-22 lead into halftime. CSUN got no closer than 15 in the second half even though nine Eagles saw double-digit minutes. On the contrary, the Eagles (4-8) played entertaining, unselfish basketball all afternoon, shooting 55 percent from the field, 50 percent from beyond the arc and earning 22 assists. They did that without starters Mason Peatling and Luka Vulikic, who are out for precautionary reasons and will be ready for the Big Sky Conference opener on Dec. 29 at Northern Colorado, Legans said. Once again, the Eagles were led by senior forward Bogdan Bliznyuk, who had with 16 points, seven assists and a game-high 11 rebounds. A few days at home made a big difference, Bliznyuk said after his 17th career double-double. Four other Eagles scored in double figures. Jesse Hunt had a career-high 14 on 6-for-8 shooting; Ty Gibson made a trio of 3-points en route to 12 points; post Benas Griciunas had 10 points and three blocks in just 14 minutes; and freshman Richard Polanco had 10 points and six boards. Tavrion Dawson scored 16 points to lead the Matadors, who haven’t won since beating Life Pacific in their opener on Nov. 10. CSUN shot just 36 percent from the field and 23 percent from 3-point range. Next up is another home game Wednesday night against the University of Providence (formerly Great Falls) of Montana, an NAIA school. Published: Dec. 17, 2017, 3:42 p.m. Updated: Dec. 17, 2017, 6:43 p.m.